Organisation has commenced on the 2006 Barassi International Australian Football Youth Tournament (BIAFYT), which promises to be the largest international youth tournament in the sport's history. The tournament, previously known as the Jim Stynes Cup, will be held from the 1st-13th of October 2006 in Canberra, though organisers intend to hold additional matches in other Australian capital cities. Patrons of the BIAFYT include AFL Hall of Fame Legend Ron Barassi and Irish AFL star Jim Stynes - two long-time champions of international Australian football. The tournament is fully sanctioned by the AFL, which recognises it in its strategic plan as the peak youth tournament for developing the game outside Australia. 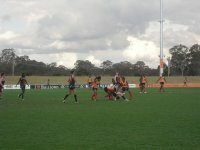 One aspect of the BIAFYT that sets it apart from other tournaments is that entry is not restricted to teams from outside Australia or national youth squads. Entry is open to any non-Australian youth team, and several Australian teams of an appropriate skill level will be invited to attend, such as past winners Kormilda College from Darwin. In addition to boosting player development, tournament organisers also intend to provide a number of cultural experiences for participants, such as visits to Australian landmarks based in Canberra. Further information about the tournament can be found at the newly re-developed BIAFYT website. Tournament organisers welcome enquiries from potential participants as they seek to maximise attendance at the event. As always, worldfootynews.com will provide full coverage of BIAFYT news as it comes to hand.